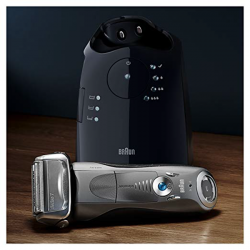 Finding the perfect shaver is one that shaves finely, closely and quickly and whilst there are many on the product market, we consider one in particular – the Braun Series 7 Pulsonic 790cc Electric Shaver. Shaving is often a tiresome and lengthy process and sometimes it isn't done right and finding a shaver that removes stubborn and nitty-gritty hairs is always difficult but the Pulsonic Electric Shaver succeeds in such a task. 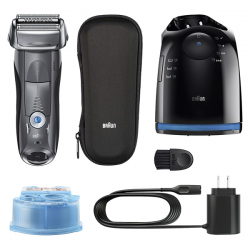 This product review will hopefully inform you on whether or not the Braun Series 7 790cc Electric Shaver is the correct shaver for you and whether it is a worthwhile investment in comparison to other shavers within the market, going into detail if it truly does remove small and stubborn ingrown hairs. Whether it be its ActiveLift Technology, OptiFoil Technology or the fact that it comes with its own Clean and Charging Station, we will assess the product in its fullest. This review will be relatively detailed so you if you don't currently have the time to read the full review, we suggest you bookmark this page and come back, so in the meantime, feel free to click the button below to view the full product details and current pricing on Amazon. 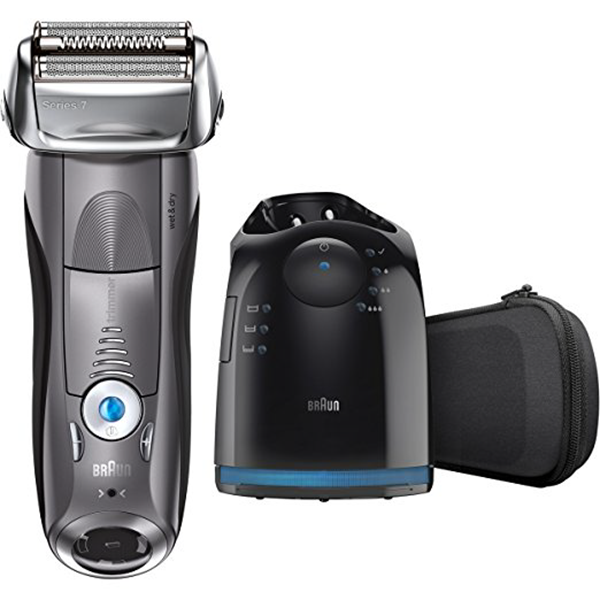 Are There Any Problems With The Braun Series 7 790cc Electric Shaver? The 790cc Shaver uses an advanced system of microvibrations, fitted with 10,000 of them with an added adaptive shaving motor that allows for better capture of hairs with every stroke, regardless of beard type. 10,000 vibrations per minute means extra power in the shaver to remove the thicker areas of your beard and automatically increases the power when it senses the resistance. This feature is therefore sure to improve the product's efficiency and will ensure shaving sessions are much faster and simpler. Another form of intelligent technology, ActiveLift allows small and flat-laying hairs that are difficult to shave to be lifted and cut accordingly. The Triple Action Cutting System as part of the ActiveLift guarantees that all hair lengths get very close shaves and ensures that your facial hair isn't cut to different lengths. This is particularly useful for guys needing shaves for bald heads, able to lift nitty-gritty hairs that refuse to be cut. The ActiveLift trimmer also works well for the neck and chin area, once again picking up the flay lying hairs that other shavers can't normally remove, capturing short or ingrown hairs, solidifying its status as a unique patented middle trimmer in the shaver product market. The OptiFoil feature essentially allows for closer shaves, capturing more hair whilst protecting the user's skin against irritation from the blades. 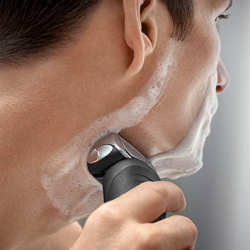 The feature helps delivery closer shaves, following the shape of the user's face and flexing the foil accordingly as the shaver simultaneously cuts down thick beard hair the first time around and the powerful motor cuts down the remaining hair to a manageable size. The adaptive feature of the OptiFoil to individual facial skin allows for a more cutting of short hairs and a closer shave, built with a unique design that also cuts and snips off more hair at once. This feature is sure to deliver the final finishing touches to the shaving experience. This super convenient and advanced feature is one of the reasons why the 790cc Shaver is unique and special where the maintenance of a clean shaver is necessary to get the most efficient and best shaves, in which the product comes with its own cleaning and charging dock. The station or dock not only lubricates and charges when in standby, but also thoroughly washes the shaver with an alcohol-based cleaning solution that kills 99.9% of harmful bacteria as well as leaving a fresh scent. This feature is extremely convenient, in which the touch of a button cleans, charges, lubricates, selects cleaning programs and dries, and the effectiveness has been proven, at 10x more hygienic than just washing it under water, making the product feel new with every session. The cleaning process is automatic and the lemon-scented cartridge improves the overall shaving experience, showcasing that the 790cc Braun Electric Shaver is truly a one of its kind. The 790 cc Braun Electric Shaver is jam-packed with versatile trimmers including the Precision Long Hair-Trimmer which specifically targets the beard, mustache and sideburns, shaving once again, small hairs that regular shavers don't take into account. The pop-up trimmer works as a simple trimmer of sideburns and stubborn flat-lying hairs in which the selection of this function is most effective after the initial shaving session has completed and helpful for removing those minor imperfections. Amazon- 10,306 reviews with an average score of 4.3/5. ShaverInsider- Average score of 4.9/5. Braun- 80 reviews with an average score of 3.9/5. The numbers show that the 790cc Electric Shaver is a product that is relatively worthwhile as an investment in which Amazon showed that 70% of reviews rated the product an amazing 5/5 which equates to about 7214 reviews of the 10306, 13% rated the product a solid 4/5, which is about 1340 reviews, 6% voted a decent 3/5, which is around 618 people, 4% voted the product 2/5 which is roughly 412 people and 7% voted the product as an unsatisfactory 1/5, around 721 people. The reviews therefore show that the product does have some unique and efficient features whether it be the ActiveLift Technology, the Cleaning Station or the OptiFoil but in saying that, 11% did vote the product as not to their likings as we will properly discuss and go into detail what the areas of appreciation and in contrast the areas of dissatisfaction. The majority of reviewers who bought the Braun 790cc Electric Shaver appreciated the ease of the product in which they greatly approved of the ease in usage and cleaning, its comfortability and durability, its pleasant scent, its versatility as both for female and male usage as perhaps the most well-liked aspect was its cleaning and charging function. Users loved the easiness of the product in terms of usage as well as the ability to clean it not only using the dock itself but that a simple rinse under hot water could clear all the hair that was shaven off. Reviewers also liked its durability where despite dropping it several times, it still ‘held itself' as well as that it was comfortable for many hand sizes, large, medium and even small, adding to the product's overall versatility and nice accommodation. Users also enjoyed the lemon-scented smell of the shaver after it was cleaned as well as the fact that women could also use the Braun 790cc shaver if all else failed. But, perhaps, the most esteemed area was the unique feature of the Clean and Charge Station in that the product could clean itself, and that the battery wasn't bad. Users loved this particular feature claiming ‘if nothing else sells you the cleaning station should', praising its versatility, convenience and effectiveness. 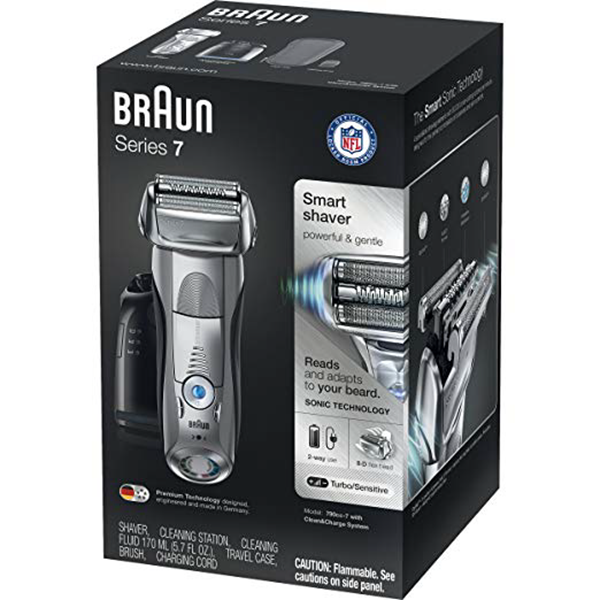 The Amazon and Braun reviews do show that there some aspects of negativity and features of the Bruan 790cc Electric Shaver they didn't thoroughly enjoy such as the fact it could cause cuts, the foils were ‘bad', it may sometimes break or stop working or that the replacements were inaccurate and not durable. The product caused cuts on individuals who probably had very soft skin or used the shaver too recklessly so this particular feedback was somewhat subjective but the claim that the foils were ‘terrible' seemed a recurring a factor in which sometimes the replacements were often expensive and that the quality of the shaver's foils were inadequate. As with any other product, the issue of a faulty machine is not an uncommon issue and it was evident in this particular shaver where users reported faults and that sometimes it stopped working, which again, happens with many other products. The issue of replacements also arose quite often which will discussed in the problems below because it was not only an aspect of negative feedback but a genuine issue that kept occurring with the Braun 790cc Electric Shaver, however, in saying that, the product is still a relatively worthwhile investment as a shaver with features that reflect its price tag especially its Clean and Charge Station. Are There Any Problems With The Braun Series 7? 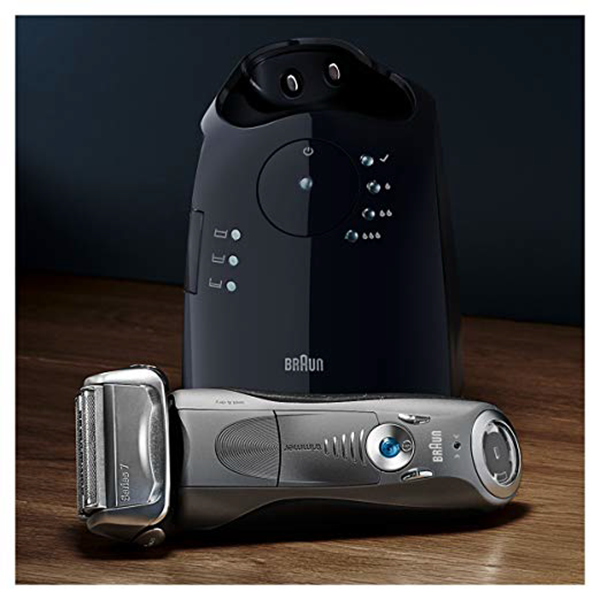 As with any product there will be always be minor imperfections and the Braun 790cc Electric Shaver is certainly no exception with 11% of reviewers rating the product on Amazon 2/5 or below. For the product to shine even greater within the shaving product market, the negatives and issues of concern must be discussed mainly, the replacement cartridges and the foils itself. Users who rated the product as unsatisfactory or ‘bad' was primarily the issue of the replacement foils as worsening in quality where with each purchase, the quality deteriorated where basically instead of the advertised durability of for example 12 months, the foil realistically lasted only 8 or even 6 months. An accompanying issue was the price of such foils in which Braun apparently does not sell the replacement foils (or that stocks ran out very fast) in which 3rd parties exploited this limited supply, retailing the prices for twice the Braun's prices. Therefore, the problems were not only inconvenient but expensive too where users were very disappointed with the quality of the foils and cartridges within the Clean and Charge Station. If this issue can be sorted in which supply of the Braun foils can be increased, the reputation and efficiency of the 790cc Pulsonic Electric Shaver can increase accordingly. With so many online retailers to choose from, consumers are always taking into account factors that will increase their overall purchasing experience as well as the amount of online retailers available to them. Online retailers such as Alibaba, Etsy or Ebay exist and users would often seek for safety, ease and convenience as well as the reputation and for that reason, we recommend Amazon because of its position as one of the largest online sellers, of not the largest in the world. Amazon boasts tight security and online protection, providing their consumers with utmost security from potential frauds or scams with customer expereince that will allow their consumers to have their products sent to them quickly, safely and easily and with a small product such as this, Amazon will ensure it comes intact. Can females use this product? Yes, gender does not matter regarding the usage of this product. Where does all the trimmed hair go? All the shaved hair goes into the solution cartridge which can be emptied and cleaned with or without the cleaning station. Does the product come with a guarantee? The Pulsonic 790cc comes with a 60 day money back guarantee as well as a 2 year limited warranty (cutter cassette and foil excluded). Users report the product as quiet or comparable to other shavers. How is the shaver cleaned? You can either wash the shaver manually or place it onto the Clean and Charging station to clean itself. If I go overseas, do I need to take the charging station with me? No, simply plug the shaver into any power outlet. Does this come with a pop-up trimmer? Yes, a pop-up trimmer is one of its functions and will ensure it removes stubborn hairs. Can I use this on my body? We recommend you do not, seeing as though it has been designed for a close facial shave. Does it shave close like a blade or do I have to go over it? Users report it shaves 90-95% and smaller hairs should be gone over at least twice. Is this shaver good for someone with shaky heads? Experiences differ but the shaver has been designed to be safe and easily accessible. Can this shave my head? Yes, the shaver has the ability to shave one's head. Can you use this shaver to shave other parts of my body? As the product is a facial shaver we do not personally recommend but users do report positive experiences with using the shaver on other parts of their body. All Braun shavers are generally made in Germany. Can this shaver be used with shaving gel? No, we do not recommend shaving gel, it is unnecessary and shaves without gel. Can you lubricate and clean the shaver manually? Yes, there are instructions on how to clean the shaver manually without the self-cleaning dock. Conclusion – Is The Braun Series 7 790cc Electric Shaver Worth Buying? We hope you took the time of your day to read the product review, but if not, we will quickly go ahead and summarise, judging whether or not the Braun Series 7 Pulsonic 790cc Electric Shaver reflects its price tag and reputation. The shaver has quite the reputation as an effective and strong shaver as users comment on its easiness in terms of usage and cleaning, comfortability, durability or its versatility, but again the decision whether or not to purchase the product is completely yours, we just want to provide a review that will solidify your intentions and clear any doubts in making a purchasing decision. With intelligent ActiveLift technology that lifts hairs to remove them quicker to adaptive OptiFoil technology that follows the shape and contour of the user's facial type to its super convenient and advanced Clean and Charge Station allows the shaver to shine within the product market as a sharp and effective shaver and trimmer. Despite its issues of replacements and varying quality experiences, the rare occasions of cuts, or the fact that users may receive faulty or broken shavers (as with any other product), the product is still a relatively strong shaver, performing its function in shaving finely and sharply, and attempts to remove stubborn small hairs and ingrown hairs that users may have difficulty with.